Visited the local Friends of the Library book sale yesterday, in the rain, where C.J. and I managed to spend much more than we intended. He got several art books and a couple of books full of house plans while I nearly completed my Jane Austen collection. Can you name the book I still have to find. 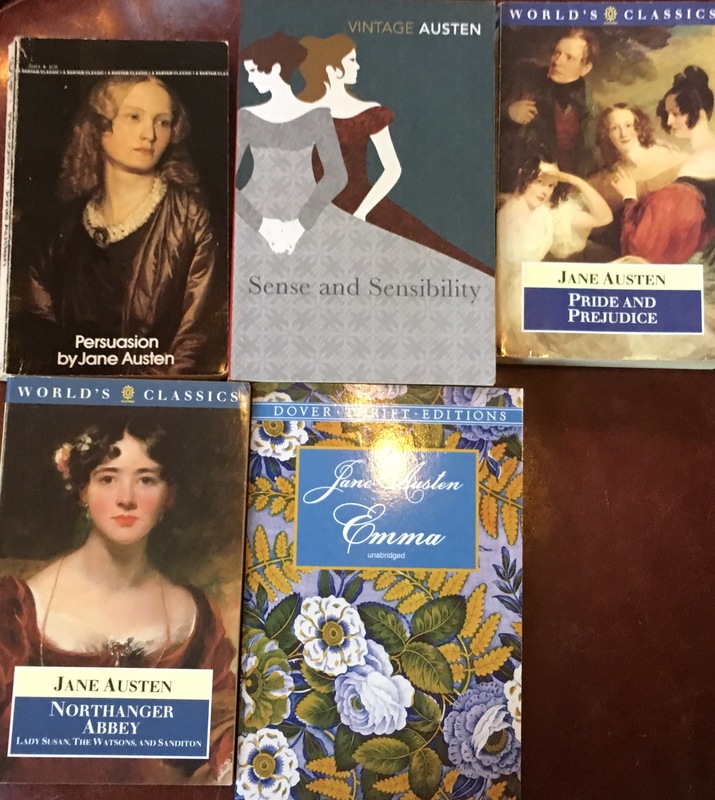 I’ve decided it’s a good time to re-read all of Jane Austen’s six novels in order. So, I’m looking for good second-hand copies of each. I’d like to have all in the newish Vintage Classics paperback editions. The top middle book is a Vintage Classics edition. I like them for the cover art. Apparently, true Janeites re-read all six novels every year or so I read somewhere. I’m not that big a fan, but I am a big fan. Once I find Mansfield Park I’ll be ready to begin. I had two near DNF’s this week, Alain Robbe-Grillet’s Repetition and Ray by Barry Hannah. While I am a fan of French novelist Alain Robbe-Grillet, Repetition did not hit the spot for me. 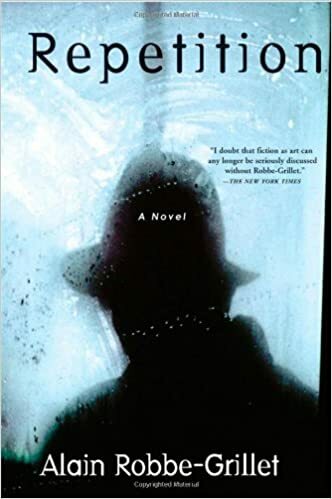 All of his work, the two other novels I’ve read so far at least, is experimental in ways I find interesting once I figure out just what is going on. Repetition concerns an agent sent on a mission to Germany during the Cold War, I think. The book opens with him on the train trying to get through to the other side when he enters a compartment to find himself already sitting there. The man, who looks just like him except he is not wearing a fake mustache, appears to be a better version of himself. Also an agent on a mission, this doppelgänger is one step ahead of the novel’s hero so much so that at times they appear to switch places in the narrative. I’m not sure. I was confused. I was confused with the other two Robbe-Grillet novels I read, but I enjoyed trying to figure things out. Confusion is a part of reading as far as I am concerned. But this time, because I couldn’t quite make out what was going on, I began to lose patience with the whole thing. Additionally, while the other Robbe-Grillet novels I read struck me as inventive and original, this one seemed like a re-tread of ideas Paul Auster has already done in his New York trilogy. 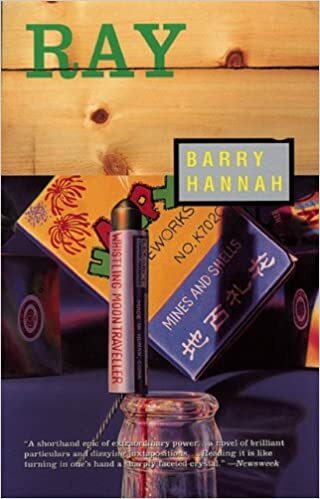 The other book I didn’t really like was Ray by Barry Hannah. Ray was on one of the Brilliant Novels You Can Read in a Day lists that I found a few weeks ago. I’ve got a little TBR list of them on one of the tabs at the top of this blog. The other one’s I’ve read so far have been knock outs so I had high hopes. Ray is a long rant about the title character’s life, his loves and the people he knows. A former pilot who flew fighter planes in Vietnam, Ray is a southerner, through and through. Which, I’ll be honest, was part of the problem for me. I know there are people, not just in the south, who use racist language freely. I know depicting this is an honest way to depict them. I understand the argument that “realistic” language gives fiction authenticity. I know, I know, I know. But I just don’t have patience for it anymore. If I never read another book with racist, homophobic or sexist language in it as long as I live, I’m okay with that. So parts of Ray were very tough going. It’s supposed to be funny, the way Flannery O’Connor is funny. I like Flannery O’Connor a lot. While I do find her funny, she’s not laugh-out-loud funny for me the way Eudora Welty is. All the little blurbs on the back mention how funny Barry Hannah is, how he’s the best southern writer since Flannery O’Connor, etc., etc. None of them mention Eudora Welty whom I think is better than Flannery O’Connor. But I just didn’t see it. I’m going to keep both books, though, just in case. Maybe a future re-reading will reveal things I missed the first time around. While I didn’t really like either one, I do recognize both are well-written books. Meanwhile, I’m still making my way through Kevin Starr’s Eight volume history of California. I’m nearing the end of the first book Americans and the California Dream which covers 1850 to 1915. I’ve mentioned before how C.J. and I plan on retiring to the Gold Country where we’ll give walking tours for the local historical society of whatever town we end up in. So we’re both reading up on California history. We’re big fans of the stuff. 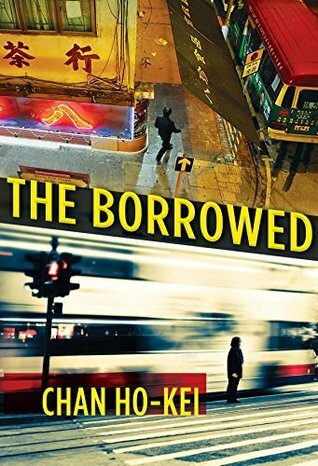 And I’m reading an import from China called The Borrowed by Chan Ho-Kei. The cover promised a modern noir tale covering 50 years of Hong Kong history, but so far it’s a very old-fashioned story. The opening section, set in modern-day Hong Kong, featured what is usually the final scene in an Agatha Christie novel. All of the suspects were gathered in a single room while the chief detective reviewed the case hoping one of the suspects would crack and reveal too much. I completely enjoyed it. It was a fresh take on this old trope to avoid all the business about gathering clues for three-fourths of the book. Why not just skip to final chapters where all the good stuff is. That a surprise murderer was revealed came as no surprise really. That he turned out not to be the real killer did. That he turned out to be someone else’s killer did, too. Each part that follows is set back in time about ten years or so, with the same set of detectives, just in their younger days. If you keep reading, you’ll always find something to balance out the disappointing reads. So far I’m enjoying The Borrowed.